Discover your new floating staircase. With sleek lines that soar in mid-air, the floating stair is quickly becoming a cornerstone in modern stair design. What are Floating Stairs? How much is a Floating Staircase? What is a Metal Stair Stringer? Get secure with modern railing choices that anchor your floating stair system. Choose from cable railing systems, glass railing systems, or rod railing systems. Rod Railing – Rods curve to transition up stairs or around corners, and they never sag over time. Glass Railing – Creative standoff pin technology makes installation simple. Custom-order for outdoor, indoor, or coastal projects. Cable Railing – Hidden components sit inside each post, so you never have exposed hardware. Your railing system is a modern art installation. All posts are pre-drilled and shipped with your customizable components attached. Post heights available in 36”, 39”, or 42”. Feel completely at ease on thick stair treads — crafted from high-quality hardwood that brings warmth and beauty to your floating system. 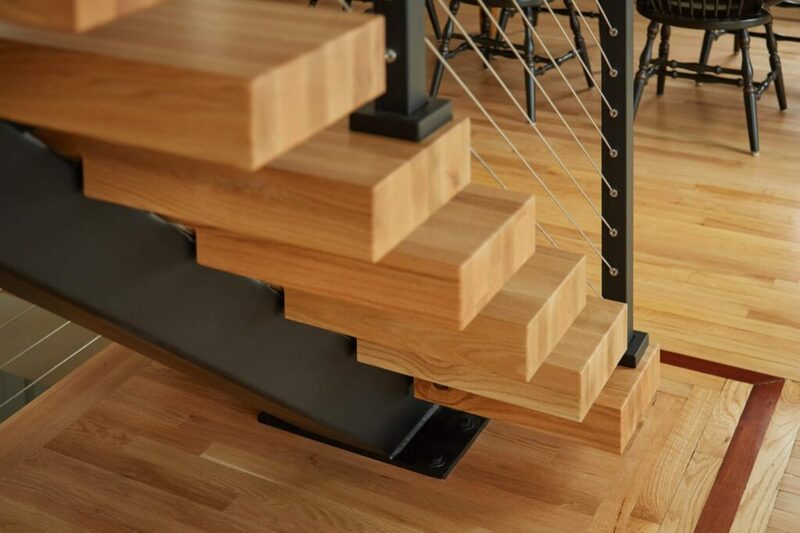 Our thick stair treads for floating stairs come in over 15 different wood species — including African Mahogany, Red Oak, IPE, and Brazilian Cherry — and they can be customized with a wide range of finishes. They are built by cutting, planing, and gluing pieces of hardwoods together. Treads are available in thickness from 1.5” – 4” and widths of 36”, 42”, 48”, 54”, 60”, and 72”, though they can also be customized to your project’s needs. Because of the quality of wood, our thick treads can withstand a lifetime of wear. One powerful mono stringer? That’s all it takes. 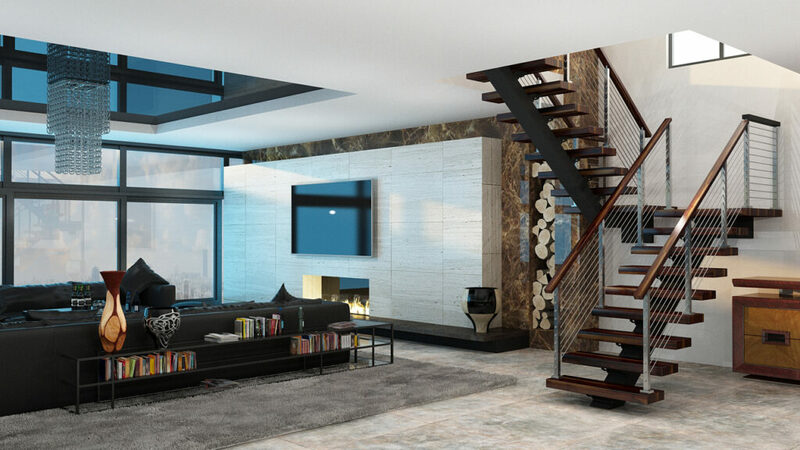 Industrial and elegant, the centerpiece of your floating stair system changes everything. Floating stairs are a captivating architectural innovation, and they are available in a wide array of designs. Whether you need a 90º degree or 180º degree turn, floating stairs adapt to your home’s needs. All stair designs boast a minimalist profile, perfect for open-concept homes. Learn more about the different designs available for your modern staircase. Learn more about how we hide our components inside the posts for a clean modern railing system. Choose from a borderless or bordered railing system to see your entire staircase. Rod railing is the superior horizontal railing option, make the most of your staircase today.